CeramicSpeed's DriveEn system works with a carbon drive shaft and bearings instead of a chain or derailleur. Efficiency is every cyclist’s dream. Imagine this, no cumbersome chain issues and significantly fewer trips to the mechanic. CeramicSpeed’s latest revolutionary drivetrain, DrivEn, offers this and so much more. Over the years, bicycle drivetrains have continued to evolve – with continued advancements in the internal gearbox and roller chain. However, even with the progress, stress free hyper-performance is still elusive for cyclists. That is until CeramicSpeed launched the DrivEn drivetrain. The system set in place replaces the standard 8-point chain sliding friction, 2 rear derailleur pulleys, and the cross chaining with merely two points for bear rolling resistance. The sliding friction from a traditional system is eliminated as power transfer occurs through ceramic bearing-tipped lobes on the front and rear pinions. In testing, the DrivEn systems created 49% less friction than a stock Dura Ace drivetrain at 250W rider output. Ceramic bearings at one end of the shaft engage the cogs. The bearings connect with the teeth on a 13-speed cassette and chain ring at a sideways angle. This is so that it can propel the bike. When changing the gear, the front bearings move up and down along the shaft, which consequently contracts and expands into the different cogs in the design. This system was designed in partnership with the University of Colorado’s mechanical engineering department. 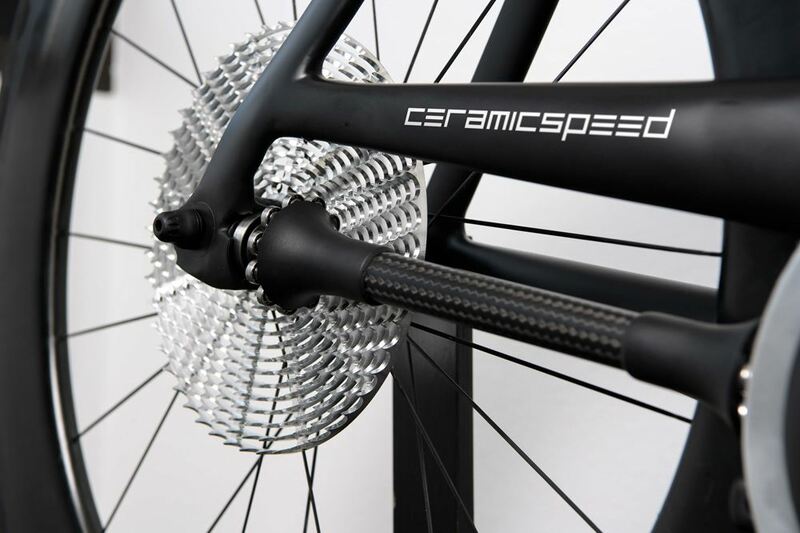 CeramicSpeed state that they used a novel shaft-drive design that eliminates the issue of sliding friction entirely. The DrivEn design system is said to have a 99% efficiency at a 380W rider output. 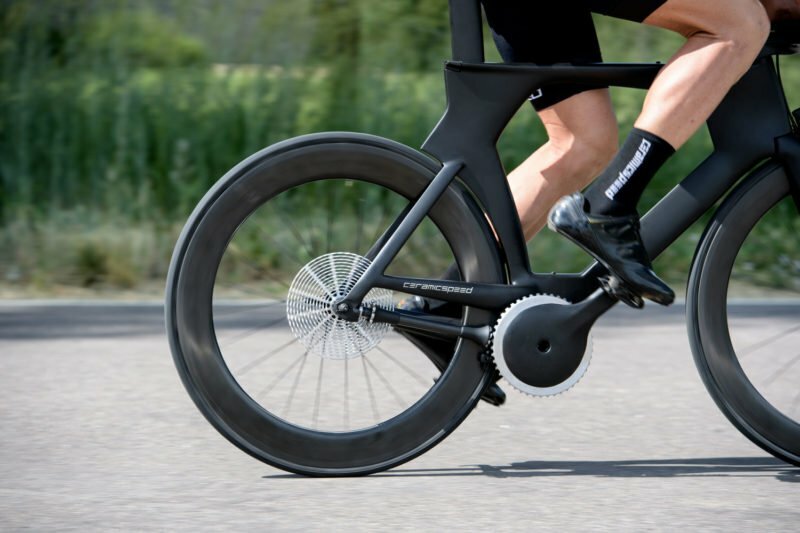 It reportedly outcompetes even a CeramicSpeed-optimized Dura-Ace drivetrain with an oversized pulley wheel system and UFO racing chain by creating 32% less friction than the fully optimized system at a 250-watt rider output. The DrivEn is a concept at the moment, not a consumer product, but it is rideable. True to their word, CeramicSpeed designed a groundbreaking drivetrain that provides the utmost efficiency. 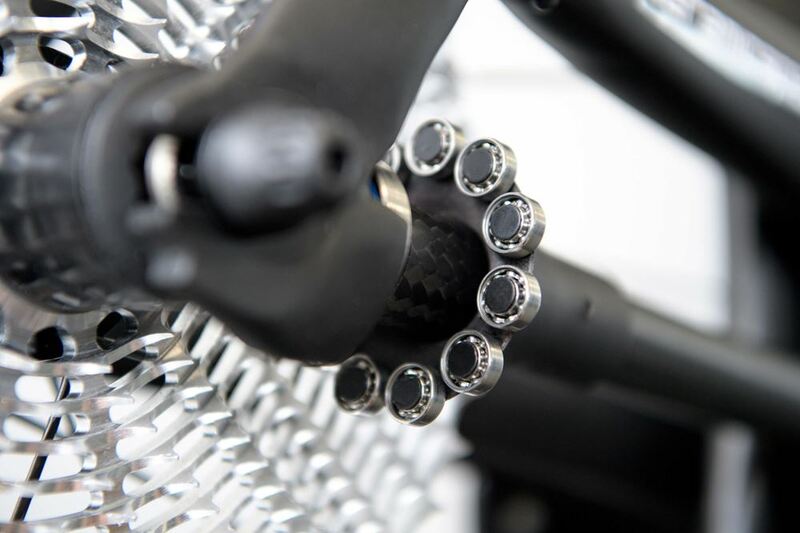 They achieved a multi-speed drivetrain that eliminates the chain and complexities of the rear derailleur. However, it is still a prototype and there are a few details about it that raise some questions. Some of the issues in question are, “will it be strong enough to withstand a 1700-watt sprint?” or “How well will it shift under different loads?”. At the moment, CeramicSpeed do not have all the answers just yet as DrivEn is merely a concept. Even though they can’t give us all the answers now, creator Jason Smith says that the future looks bright. All in all, the DrivEn drivetrain concept is a great step towards the future of hyper-efficient drivetrains. I would like to see how the shifting mechanism actually changes positions on the cassette. Changing the ratio of crank to drive-wheel rpm’s is not depicted in the video. Although the 13 speed cassette alludes to a capability for changing crank to drive-wheel ratios, an actual ability to do so is not depicted! It appears that the design is not actually set-up for anything other than a single speed/fixie drive system! Keeping it simple by leaving off all the other moving parts needed for shifting is a part of how they achieve fantastic efficiency. A more honest comparison would be comparing their drive system to a single speed bicycle’s chain drive with no derailleurs. There are advantages to their system, but reduced maintenance won’t be one of them, especially for those of us who ride in less than absolutely pristine conditions. Those exposed miniature roller bearings are going to be a bear to keep up. According to this video https://www.youtube.com/watch?v=rrvQPRcf6KI the shaft houses a battery and a gear shift motor that moves the rear end. The electronics also make sure that the gear change occurs when adjacent notches of the gear plate are in phase. But that video still does not show that this does work yet. Still looks promising. In any case, the tiny ball bearings will definitely need a protective housing against grinding sand. It’s a new revolutionary road bike. Seems truly efficient. Need more video on mechanism.